When your cruise ship pulls into the Keelung port of Taipei, discover northern Taiwan highlights on a shore excursion to Jiufen and Yehliu National Geopark. Enjoy a scenic drive on the Great Ocean Road to boulder-strewn Yehliu for a look at fantastic geological formations shaped over time. Then stroll the cobbled Old Street of Jiufen, a former gold mining town with a cinematic history. This guided small-group tour, limited to 15 people, includes a visit to the restored Shengping Theater House and a seafood lunch plus round-trip transport. Upon pickup from Taipei’s Keelung port, meet your guide and start your full-day shore excursion with an approximate 1-hour drive along the Great Ocean Road to Yehliu National Geopark. Situated on Taiwan’s northeast coast, Yehliu’s scenic headland provides a photo-worthy view surrounded by eponymous boulders like Queen’s Head. Enjoy a seafood restaurant lunch at the fishing harbor before traveling by minivan to your next destination: Jiufen. 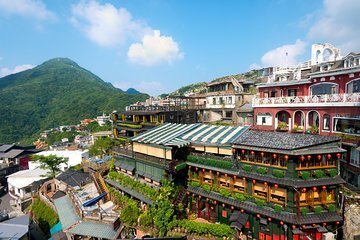 You’re introduced to the formerly prosperous gold mining town on a walk down the cobblestone path of Jiufen Old Street, lined with cozy teahouses. If you’re tempted to try local snacks, your guide can recommend treats like sweet taro balls, rice cakes and grilled squid (own expense). See old houses in Jiufen’s residential area and explore a mountain pathway for a scenic glimpse of the Pacific Ocean before your guide takes you to the Shengping Theater House, where you’ll discover Jiufen’s cinematic past. Originally built for the mineworkers' after-hours entertainment, it was the first movie theater in northern Taiwan. Admire the restored ticket office, seats and stage, as well as vintage movie posters and defunct equipment. Your guide discusses the town’s more recent filming sites for A City of Sadness and the Oscar-winning animated feature Spirited Away before your small-group shore excursion ends with return transport to the cruise terminal. Worry-free Shore Excursion:We will ensure your timely return to the Taipei port for this activity. In the rare event your ship has departed, we will arrange for transportation to the next port-of-call. If your ship is delayed and you are unable to attend this activity, your money will be refunded. See our terms and conditions for full details. Fantastic tour guide -- much better to do this tour rather than stay in Taipei. Get a real feel for Taiwan. The Juifen town was very authentic and a wonderful experience. Highly recommend this tour. The Geo park was interesting and worth stopping for 45 minutes. I could not give a fair review as the weather on that day did not co-operate and it was cold and wet.I commend the guide who was excellent. We enjoyed the trip and can certainly recommend this. The Yehliu National Geopark was wonderfull and we liked the old Jiufen Gold Rush Town. The lunch was average, but I think this was the best one can get in this region.